support the goals and objectives of the MRMCA and its Promotion Council. Concrete industry professionals gathered at Dutch’s Daughter Restaurant for networking, lunch and the promotion awards. 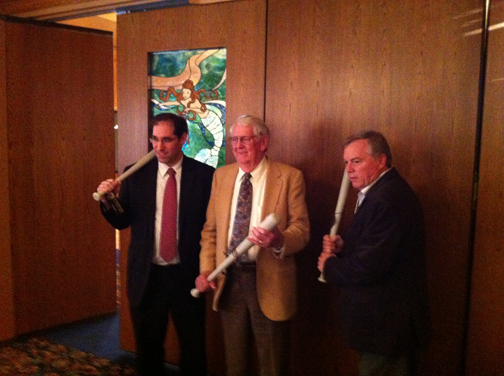 Tom Evans, MRMCA’s Executive Director, noted, “…as we recognize these individuals today, let us all be reminded that each one of us has a “role” within the industry to promote!” This year, Evans presented concrete baseball bats to Steven Tripp, Marketing Manager for Chaney Enterprises and Rodney Meyers, Technical Services Representative for BASF – The Chemical Company. Mr. Meyers continued promoting as he received his award, stating, “The next Pervious Concrete meeting is December 11th and we need key producer and contractor members to attend.” Mr. Tripp noted as he accepted his award, that it is everyone’s job to promote and association members need to make it a higher priority. The MRMCA is a Maryland trade association with active members who promote the use of concrete as a preferred material of choice for pavements and structures.